Desktop publishing essentially combines the tasks of production manager, layout and paste-up artists and typesetter. The term describes a category of software dedicated to page layout and design. Before importing text or graphics, the page is laid out to present a comprehensive document structure: page size, margins, columns, headers and footers. Edited text and completed graphics are brought into the DTP program where they are assembled on the page for publication. In the design process, the text is also assigned various attributes such as bold, italics and fonts. Graphics are placed and scaled to suit the layout. Final editing for finished output is completed, then the document is printed. Of course, to be even marginally effective, DTP programs must be fully WYSIWYG. Timeworks has a reputation for producing well-designed software. Their products fill the needs of the ST market: simplicity of use carefully balanced with a wide range of features and functionality. It's hard to find fault with their approach and, if particular products may be open to specific criticism, overall they do an excellent job of filling the major software niches with solid, bug-free products. Publisher ST, written by GST, adds considerably to Timeworks' existing line, bringing a desktop publishing program (DTP) to challenge Publishing Partner's hold on that market. Both programs are quite similar in their strengths and weaknesses. 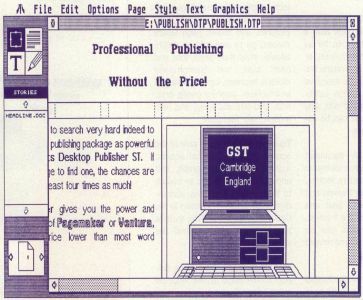 Modelled after Xerox's popular program Ventura Publisher for the IBM PC market, Publisher is not merely a clone, but provides its own features and has several functions Ventura lacks. However, anyone accustomed to Ventura will find themselves on familiar ground with Publisher. Owners of Timeworks' Word Writer will also find that their text converts automatically to Publisher format, including all type attributes and styles. Master page: This is the underlying page layout that will be carried through from page to page. 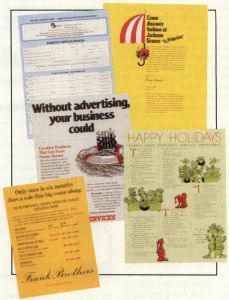 To allow for two-sided printing, right and left master pages alternate margins to accommodate binding or hole punching. Frame: Everything imported goes into a frame. Each column of text in a multi-column document is a frame that must first be drawn. Frames can be created on the master page(s) to repeat through the entire document, or as needed on each page. Frame outlines can be made visible and given various thicknesses and shades. Paragraph: A paragraph is defined as text that ends with a carriage return. This can be as large as your entire document, or as small as a word or a character. Each paragraph can be assigned its own style, with unique justification, font, spacing and tabs. Any number of paragraphs can be assigned a single style. Style sheet: A document consists of the common elements (paragraph styles, headers, footers, master pages, empty frames) and the specific elements (text and graphics assigned to the frames). The common elements can be saved as a style sheet and reused by other documents. Text: Publisher provides limited text editing capability, so it's best to use a word processor to edit before importing text. However, you can do final editing in Publisher and assign specific words or characters bold, italics, underlining, or select a font different from the rest of the paragraph. Graphics: In Publisher you can edit an imported graphic on a pixel level, as well as manipulate the size and shape of it. The object-oriented draw package permits line drawing, rectangle, circle, ellipse and freehand drawing. Although not as sophisticated as a CAD program, you can use the built-in graphics for labels, flow charts, arrows and simple but elegant illustrations. Publisher supports several file types: Word Writer, 1st Word, 1st Word Plus and Word Perfect for text, as well as ASCII. Unfortunately for the thousands among us who use it, ST Writer is not directly supported. For graphics, you can import DEGAS, Neochrome, Easy Draw, and GEM Paint and GEM Draw, neither of which DRI has released for the ST. Menu bar: Pull-down menus include file (load, save and print functions), edit (cut, copy and paste text, frames or graphic objects), options (various display options, column guide settings, hide pictures, and more), page (zoom modes, go to and add or delete pages), style (text style, font and point size), text (search and replace, hyphens, kerning, headers and footers), graphics (scale, crop, edit, grid size and snap) and help (online help features). Tools: The left-hand side of the screen displays the tool access: icons for frame, paragraph, text and graphics allow you to switch to their unique functions, also indicated by icons. A selection in the Options menu allows you to hide the tool area and expand the workspace. Workspace: This is the display of the page at the selected zoom (magnification) level. It uses GEM scroll bars for positioning and can show rulers (in imperial, metric or pica/point units) along the top and left borders. All editing is done in the workspace. All Publisher commands and features are activated by the mouse through either the menu or the tool icons, but most can also be called through keyboard equivalents. Timeworks has a reputation for producing well-designed software. Their products fill the needs of the ST market: simplicity of use carefully balanced with a wide range of features and functionality. Supports color or monochrome monitors. Atari SLM 804 Laser Printer; all Postscript-compatible printers, and Okidata Laserline 6 (512K). All printers compatible with those listed above. Ventura users may be surprised to find that Publisher supports the Epson LQ series as well as several other popular printers, which Xerox fails to do, limiting its dot-matrix support to the MX/FX series. Also, the graphics editor in Publisher has more flexibility and you can edit imported graphics, something Ventura doesn't offer. And while Ventura's built-in fonts are, except for Postscript printers, very limited, the Publisher comes with seven fonts, which can, depending on your printer, be displayed in sizes between six and 72 points. Finally, Publisher comes with 23 files of 200 ready-to-use graphic images. On the minus side, the Publisher has no means to create text columns within frames. Columnar text must be manually designed by creating a separate frame for each column, then assigning text to flow from the first into the next frame. This can lead to a lot of agonizing tinkering to get precise columns and locations. Ventura's method of selecting the number of columns, then having the program figure the default widths (which can be manually adjusted), is far easier and sophisticated. Here's a typical example, from the type of document I work on every week: on a two-column page, a three-column frame must be created to hold separate tabular material. In Ventura, this is an easy task, requiring only a few moments of effort. In Publisher, it is a demanding exercise in which excruciating care must be taken to insure that the frames are precisely placed and are the proper size. There are other features available in Ventura and not in Publisher which offset the seeming advantages of Publisher's extras. For example, although you can start a paragraph with a bullet, you cannot start with a drop cap (a large initial character), nor can you specify automatic page breaks within the text. There is no means to do automatic indexing or table of contents, nor can documents be chained for any purpose. Frames cannot be anchored to specific text points nor can they be given captions or automatically incrementing figure numbers. Page numbering is in Arabic only, with no provision for Roman numerals. If the comparison between the two appears unfavorable, remember that Ventura costs roughly five times what Publisher costs! The biggest factor that makes the Publisher fall below the professional use category is the manner in which it handles text flow between frames. Since each frame is independent, you can assign any text or graphic file to it. However, if the text file is too large to fit into the frame, it does not automatically flow to the next. There is no simple means to link frames and tell the Publisher to fill contiguous frames with a file. You must click on each frame, then on the file, then on the next frame into which the text will flow, then on the file, and so on until the text is exhausted. Although this gives you moderate flexibility in determining where text will go, it is a tedious process with a large file. In my work, I often deal with 200 or more page documents, and I can't spend my time pointing and clicking over several hundred pages. "The biggest factor that makes the Publisher fall below the professional use category is the manner in which it handles text flow between frames." You also can't create a frame to handle text out of order. That is, if an article doesn't fit the frame on page seven, I can't create a new frame on page six to handle the overflow. What will happen is that the text will start flowing from page six, although it was initially assigned to page seven. Frames have a strict front to back, left to right sequence. Also, because of their independence, once you establish a frame on a page, you cannot change it for the whole document if anything has been added to it, even if you alter the master page frame itself. This means that, if you have just finished designing and editing your 12-page newsletter and want to increase the sizes by 1/4 inch, you have to start all over again, because the frame sizes are fixed for good. Going to a new page requires confirmation that you indeed want to create a new page. In a large publication, this simply adds unproductive time to the process without returning anything in equal value. Kerning—minute adjustments between letters—is another issue where the Publisher is inferior to Ventura. You can kern individual letters but there is no provision for automatic document or paragraph kerning. Even had they simply provided automatic kerning for the 20 most commonly kerned pairs, it would have vastly improved the program. Lack of kerning is most noticeable in Postscript and typesetter output, where fonts carry correct kerning information in their data file. A quick glance through the Publisher's manual shows that they did not use their own program to create it, because the manual is properly kerned throughout. This, unfortunately, also drags the Publisher's output down below the requirements of professional publishing, since no one is likely to engage in the Herculean task of manually kerning a 300-page document, much less a single chapter. And, simply put, professional documents demand kerning. Despite these drawbacks, Publisher is not at all a bad program. It is simply better suited for noncommercial or non-professional efforts, such as user-group newsletters, small in-house publications or hobbyist publications. I wouldn't suggest you use it for magazines, books or anything larger than about a dozen pages. But for less ambitious efforts, it's more than suitable. I've tried my best to confuse Publisher and make it crash, without success. It seems pretty ruggedly built and able to handle my erroneous input, wrong file types and overloaded memory. The printed output is clean and the dot-matrix printout is better than Ventura's modest effort. All in all, it does a job that, if not particularly suited for printing your next novel, is certainly better than anything you can do with a word processor!.